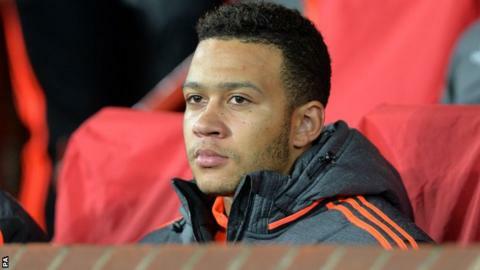 Manchester United manager Louis van Gaal says he wants more from "inconsistent" winger Memphis Depay. Depay, 21, cost United £31m when he joined from PSV Eindhoven this summer but has not made a league appearance since defeat by Arsenal on 4 October. Van Gaal said: "Of course [I expect more] because otherwise he would still be in the team. "But players in that age are not consistent. I don't have a quarrel with the player - it's a matter of form." Depay scored 22 goals as PSV secured their first Dutch title since 2007-08 last season. He has scored just once in the Premier League since making the move, and has not featured at all in the past four league fixtures, with Jesse Lingard moving ahead of him. "I worked a lot with Memphis. He's a great guy and his development in the last two years is incredible. He deserved his transfer to United in the Premier League. "He has some criticism now, but nowadays it's normal in football that when you're not playing well for a couple of games people start the criticism. Most of the time the criticism isn't about his football but about other things and I just hope that he comes back stronger from this." However, with Wayne Rooney and Anthony Martial both set to miss Saturday's match at Watford, the Netherlands international could earn a recall. "He is always looking very good in training," said Van Gaal. "But when you change the player then the other player has a chance. And that other player is Jesse Lingard. And he played very good. "I look for another solution in my team and I have kept Jesse Lingard and Andreas Pereira, for example, for that option. "Now Depay has to fight back and he does it, so I am satisfied."